Your family is invited to experience a Music Together® class before you enroll. 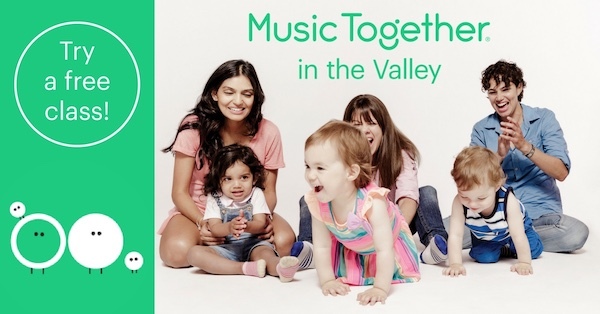 In a research-based, playful, Music Together class led by a trained teacher, you and your children from birth through age 5 can get in touch with your inner musicians and connect with other families. No preview classes currently scheduled? Sign up to visit one of our current session classes as a free demo! Need more reasons to try Music Together? Each weekly class offers songs and rhythmic rhymes, including finger plays, small- and large-movement activities and instrument play. Our research-based curriculum not only develops music skills, it nurtures creativity, self-expression, and confidence while also supporting social, emotional, cognitive and physical development. Infants, toddlers, and preschoolers participate at their own levels in family-style classes of mixed ages so siblings can attend together. If you join us for a ten-week session, you'll take home award-winning music to use at home and on the go: A CD, a corresponding illustrated songbook, parent education materials, and exclusive online resources through the Family Music Zone and Music Together’s mobile app.